In most families things get passed down from generation to generation. These maybe such things as bibles, china, pictures, books, clothing, photographs etc. In all probability we can best describe these items as family memorabilia or family heirlooms. After my mother died so it was with me, in amongst a small box of costume jewellery was an old blackly tarnished silver medal. 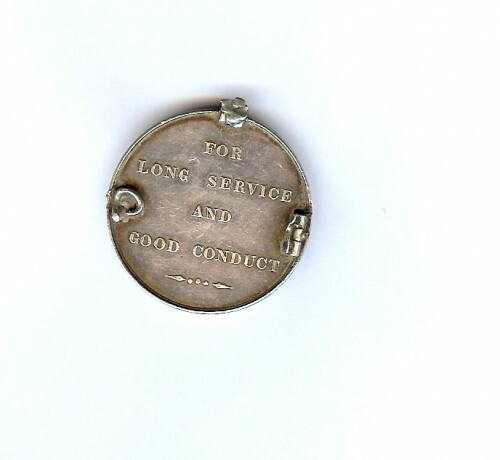 With no ribbon or suspender it had, at some point in its life, been transformed into a badge or brooch with a clasp soldered onto the back, but still plainly visible were the words “For Long Service and Good Conduct” Looking closely at it I could make out the inscription on the rim “74. SERGT J. FAULKS. 1 – 17 FOOT. Intrigued, I wanted to find out more about Sgt J Faulks. I knew my Great Great Grandfather was John Faulks (born 1842) but I was not sure what his occupation was. In the 1881 census he is described as a ‘Pensioner’ at the tender age of just 39! However in later census his occupation was described as a Clerk and Printers Clerk. In the same 1881 census I see my Great Grandmother aged 8 was born in Lucknow East Indies. The Army Long Service and Good Conduct medal was first authorised in 1830 and to receive it the basic requirement was to have served 21 years in the ranks with a high standard of conduct. So what I wanted to find was his army service record. This would detail when he joined up, where he served, when he was promoted and hopefully a whole host of other information. Service records for this period are held at the National Archives in Kew London and it was from there that I got what I needed. His record states he joined the 17th Regiment of Foot in Leicester on 12th October 1857 aged 18. Now unfortunately he must have lied about his age (a common practice at the time) as I know he was born in May 1842 so he was 15 years 5 months old when he signed up. He was promoted Corporal in 1868 and to Sergeant by early 1870. During his service he spent nearly 7 years in North America and 9 years in the East Indies. He was awarded this medal on 22 November 1876 and with it a £5 gratuity, not an insignificant amount in 1876! All this information and the starting point was a medal issued for Long Service and Good Conduct over 135 years ago.